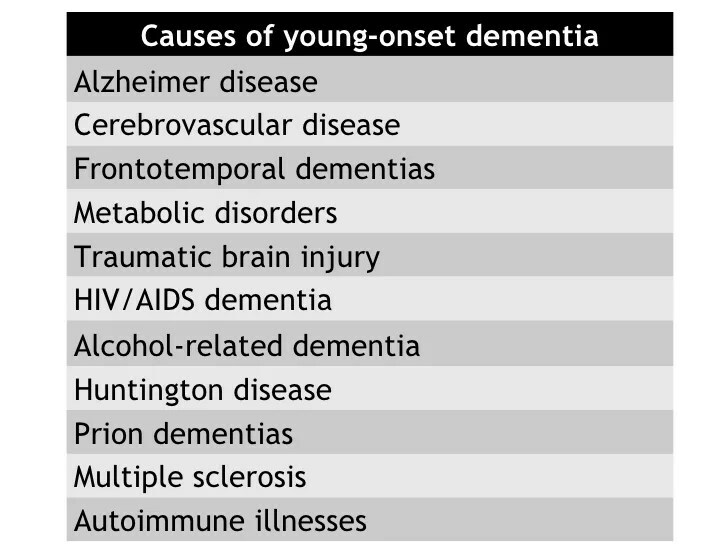 What are the causes of young-onset dementias? As you read in my previous post “What is Alzheimer’s disease,” there is a sub-type of AD known as young-onset dementia. This name refers to dementia that begins before age 65. The following information comes to us from Alzheimer’s Society, the UK’s leading dementia support and research charity for people living with dementia, their families, and care partners. And also one of my favorite sites to find news and information on Alzheimer’s disease and other dementias. People diagnosed with dementia under the age of 65 are often described as ‘younger people with dementia’ by health and social care professionals. Other terms used include ‘early onset dementia’, ‘young-onset dementia’, and ‘working age dementia’. The symptoms of dementia may be similar regardless of a person’s age, but younger people may have different needs, and require some different support. This factsheet looks at the types of dementia that younger people may have, some of the difficulties that they might experience and where support can be found. There are more than 40,000 younger people with dementia in the UK. Being told that you or a loved one has dementia can be very difficult and you may experience a range of different emotions as time goes on. There is support available if you need it. Alzheimer’s Society’s National Dementia Helpline can provide information, support, guidance and signposting to other organisations. Details are at the end of this factsheet. Around 12 per cent of younger people with dementia have frontotemporal dementia – a higher prevalence than in older people (see factsheet 404, What is frontotemporal dementia?) Frontotemporal dementia most commonly occurs between the ages of 45 and 65. In about 40 per cent of cases the person has a family history of the disease. Around 20 per cent of younger people with dementia have a ‘rarer’ form of the disease – a higher prevalence than in older people (see factsheet 442, Rarer causes of dementia). Examples include conditions that can lead to dementia, such as Parkinson’s disease, Huntington’s disease, and Creutzfeldt-Jakob disease (CJD). Getting an accurate diagnosis of dementia can take a very long time for younger people, often due to lack of awareness that dementia can happen in younger people. Medical professionals often misdiagnose younger people as being depressed, experiencing relationship difficulties, suffering from the effects of stress or, for women, it may be put down to the onset of the menopause. The contribution of family members and carers is often very important in helping to reach a correct diagnosis. Many people say the first sign that something was wrong was that the person ‘didn’t seem quite themself’ or they started to make mistakes at work that didn’t fit with their usual performance. It may be helpful to keep a symptom diary when you first suspect that something might be wrong. Specialist diagnostic services for younger people with dementia tend to be run by neurologists with a special interest in cognitive problems and dementia – however, these are few and far between, due to lack of resources. Consultants appointed to be responsible for younger people with dementia also tend to be neurologists. If a GP decides that specialist assessment is required, it may not be clear which type of consultant the person should be referred to. Specialists in old age psychiatry are usually responsible for older people with dementia. Someone with suspected young-onset dementia may be referred to a neurologist, a psychiatrist or an old age psychiatrist. The route to diagnosis can be complicated, and younger people with dementia can receive very different levels of support from different doctors and professionals. A few areas in the UK have consultants with specific responsibility for younger people with dementia. A specialist diagnostic service should help younger people get access to care more quickly and easily. There is little awareness or understanding of the needs of people who develop dementia at an early age, and this can make it very difficult for younger people to access adequate support. Even if dementia services accept younger users, the type of care they provide may not be appropriate. The needs of younger people with dementia and their friends and family are not just related to age. Younger people may have different concerns and interests to older people. A service set up for people of a different generation, where activities are planned for older people who are less physically active, is unlikely to meet the needs of younger people. Younger people with dementia require specialist services, able to meet their complex needs. Specialist services should strive to help people maintain their day-to-day skills, friendships, hobbies and interests, and support people to continue to live an active life as a member of the local community. For information on what is available locally, contact your local social services department or GP surgery. You could also call Alzheimer’s Society’s National Dementia Helpline on 0300 222 11 22.
have a rarer form of dementia. Some people with dementia may want to continue working for some time after their diagnosis, or may wish to take early retirement if this is appropriate. Carers may also want to continue working, or may be concerned about giving up work to care full time. Alzheimer’s Society can advise on some aspects of work and finances, but people with dementia and carers might need specialist advice. This may be available from a disability employment adviser at the local Jobcentre Plus, or from the local Citizens Advice Bureau (see ‘Useful organisations’). People should also make sure that they are receiving the benefits to which they are entitled. For more information, see factsheet 413, Benefits. If the person has children it is important that they understand – in an age-appropriate way – what dementia is, how it affects their parent and what changes to expect. Every child is different and will react in their own way. See factsheet 515, Explaining dementia to children and young people for advice on how to talk to children about dementia. Some people with dementia are able to drive safely for some time after their diagnosis, but there will be a point at which they will have to stop driving. For many people with dementia, the decision to stop driving can be difficult. See factsheet 439, Driving and dementia. Because dementia in younger people is comparatively rare, it can be difficult to find other people who understand the situation. Alzheimer’s Society can put younger people with dementia, their families or carers in contact with others in their local area, or in similar circumstances. Many of the Society’s local services provide specialist support for younger people with dementia. If they do not, they can usually advise younger people on other services in the area, and direct them to any specialist services that are available. Alzheimer’s Society supports anyone affected by dementia, regardless of their age or diagnosis. There are also voluntary organisations that support people with different forms of dementia and illnesses that have dementia symptoms – see ‘Useful organisations’ for details. 1503 – Who are all these health professionals? Body that works to improve the lives of people with disabilities. Provides a range of information in print and online. Your local Citizens Advice Bureau (CAB) can provide information and advice in confidence or point you in the right direction. To find your nearest CAB look in the phone book, ask at your local library or look on the Citizens Advice website (above). Opening times vary. Supports people with prion diseases, including forms of Creutzfeldt-Jakob disease (CJD). Provides a range of information on the various forms of prion disease, and works with professionals to improve the level of care provided for people with these conditions. Helpline for advice or information about claims for Disability Living Allowance, Attendance Allowance or Personal Independence Payment. Provides information, advice and support for people with frontotemporal dementia and their carers. National information and support charity focusing specifically on young onset dementia; created with and for younger people, families, friends and supporters. This factsheet has also been reviewed by people affected by dementia. A list of sources is available on request. Related information: View more information relating to younger people with dementia. Younger Onset Dementia Association Inc (YODA Inc), based in Australia. This entry was tagged alzheimer's disease and other dementias, young-onset dementia. Bookmark the permalink.